They say you should never work with children or animals. Birmingham’s Hippodrome obviously didn’t listen to that trope, as the last two shows I’ve seen there have been Matilda and then, last night, War Horse. Both have been brilliant. 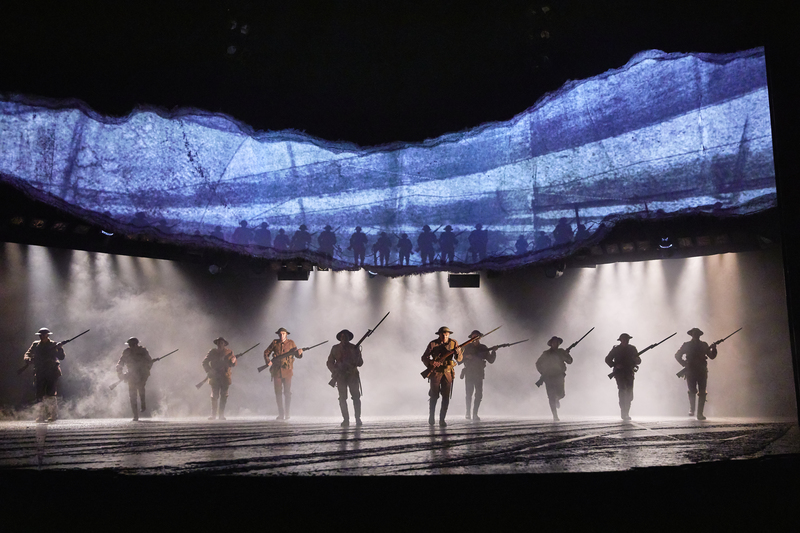 I hadn’t seen War Horse and came prepared for puppetry and impressive staging; I left moved by the production’s music, powerfully acted script and an immersive journey, which ended in a standing ovation. War Horse is a play based on the book of the same name by children’s writer Michael Morpurgo, adapted for stage by Nick Stafford. Originally Morpurgo said “they must be mad” to try to make a play from his best-selling 1982 novel. However, after debuting at the National Theatre, it was moved to West End and then Broadway, becoming a huge success. Not so mad, after all. At the outbreak of World War One, Joey, the beloved horse of a boy called Albert, is sold to the Cavalry and shipped to France. He’s soon caught up in enemy fire, and fate takes him on an eventful journey, serving on both sides before finding himself alone in no man’s land. You can find out more about the genius puppetry in a TED talk here. At the heart of the play are astonishing life-sized horses by South Africa’s Handspring Puppet Company, who bring breathing, galloping, charging horses thrillingly to life on stage. There’s a moment in the first half when Joey turns from foal to full-sized horse, rearing up towards the audience. It’s spectacular, particularly against the stark black staging and dramatic lights. It’s one of many moments when you forget you’re watching puppets: the horses breathe, kick, snort, walk, and live. However, the puppetry doesn’t overshadow the script and human performances (which was my main worry for War Horse). On World Mental Health Day, moments which stood out included one of the fathers telling his son to “pull yourself together boy” before packing him off to War. Promises that everything would be “fine” recurred throughout, and the production stressed the emotional toll which War has historically had, on young men especially. I always say that some of the best stories have been written for children. With War Horse, Morpurgo’s magical tale of suffering, humanity and hope has been turned into an emotive show for all ages. It’s a classic. And yes, I cried. War Horse runs at Birmingham Hippodrome from Wednesday 10 October – Saturday 3 November with tickets from £29.50. For more information and to book tickets you can visit birminghamhippodrome.com or you can call Information and Sales on 0844 338 5000.